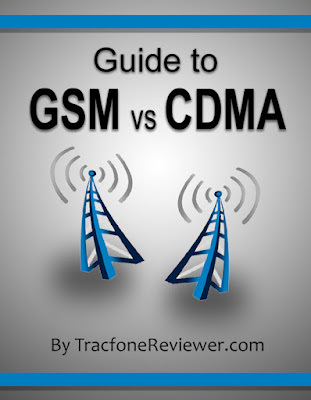 What is the Difference Between GSM and CDMA Tracfones? Welcome to TracfoneReviewer! This post updated March 2019. Tracfone Wireless is a low cost, prepaid cell phone service provider that uses other major cell service towers from Verizon, Sprint, AT&T and others to provide service. Tracfone offers two general types of phones - CDMA and GSM. But what is the difference, and how can you tell which one you have, and which one you should get? Get those questions and more answered right here! What Are GSM and CDMA Cell Phones? GSM, which stands for Global System for Mobile communication, is the more popular cell phone standard worldwide, but not as much here in the United States. AT&T and T-Mobile use GSM networks for all their cell phone service, and Tracfone cell phones that use GSM run off of one of those two major carriers (mostly AT&T). CDMA stands for Code Division Multiple Access and is less popular world wide, but more popular in America. It is used by Sprint and Verizon for their cell phone service, and any Tracfone devices that use CDMA typically is using Verizon's networks.. So, GSM or CDMA cell phones are simply cell phones that run on one of those two networks. This is a common question with Tracfone users that has a very simple answer. If your cell phone ends with a 'C' it uses the CDMA Network. An example is the LG 505C. Notice the 'C' at the end of the name. All Tracfone mobile devices that end with "C' use either Verizon or sometimes other CDMA networks. If your cell phone ends with a 'G' it used the GSM Network. An example is the LG 840G. All Tracfone cell phones that end with this 'G' use the GSM network, which is either T-Mobile or AT&T. GSM phones have been very popular with Tracfone, but recently there has been a wave of Android smartphones for Tracfone and they all use Verizon CDMA service. Tracfone has also started using 'VL' at the end of some of their smartphones, which indicates it is Verizon - LTE. The Samsung Galaxy Luna Pro (S327VL) is an example. Some Tracfone GSM smartphones also use 'AL' or 'BL' to indicate LTE service with either AT&T or T-Mobile. On most smartphones you can find the SIM number on the SIM card, or with the packaging. Here is a tutorial from Tracfone that walks through finding and checking your SIM card number. For more on these smartphones, visit our Cell Phone Reviews page where we have a full list including all of the recent Android smartphones. Should I Buy a GSM or CDMA Tracfone? This is also a question we get here at TracfoneReviewer quite often. Many people are unsure which type of phone to get, those ending with 'C' or 'G'? Here is what it comes down to: As mentioned above, Tracfone cell phones ending with 'C' or 'VL' use the CDMA networks of Verizon and phones ending in 'G' or 'AL'/'BL' use AT&T and T-Mobile. Thus, you should get the phone that will use the network that has the best coverage in your area. This may take a little research to discover, you may want to talk with friends or look up information online, but when you have found which major cell phone provider works best in your area, use the cell phone from Tracfone that will use that network. Many cities have either GSM or CDMA as the more dominant provider for a variety of reasons, so be sure to find out which will work better. You can go on the Tracfone website and shop for cell phones there, where they will ask for your zip and determine which type of phone you should get. Many of the Android smartphones Tracfone has released use CDMA (Verizon) cell service. There are a few that also use GSM service. Check before you buy that you are getting the right one for your area. In some cases, Tracfone may indicate that only GSM or CDMA works in your area, but in reality both may work. And remember, you can always buy an unlocked smartphone and bring it to Tracfones BYOP program using either CDMA or GSM service. We just reviewed the Unlocked Moto G7 which can be used with either either network. In the end, do a little research and you should find which type of phone will work best in your area. Tracfone cell phones use either GSM or CDMA. Below we will share a list of cell phones from Tracfone organized by which type of network they use. This list does not include all of Tracfone's devices, but many of the most popular ones with newer devices listed first. Additionally, you can visit the Tracfone website and go to 'Shop' and they will ask for your ZIP code, and then show you currently available phones for your area. Tracfone allows users to bring GSM or CDMA smartphones (usually unlocked) to use with their BYOP 4G LTE service. Visit our Tracfone BYOP page to learn more. There are many more cell phone options from Tracfone besides these, but this is just a sample of cell phones categorized by which network they use. Take a look at our Latest Tracfone Cell Phones List to keep up with the newest releases. You may also find our recent posts, Top 3 LG Phones from Tracfone and the Best Tracfone Prepaid Cell Phone interesting and useful in finding a cell phone. We hope this helped to answer questions, and if you have any more, just ask them in the comments. Share this with others who also might find it beneficial! EDIT: For those who might be looking for zip codes that will allow you to shop for CDMA cell phones on the Tracfone website, here is one that worked: 89301 - Ely, NV. Welcome to TracfoneReviewer. We share news, reviews and information about Tracfone Wireless. The Luna Pro is a Android smartphone released by Tracfone with upgraded performance over the original Galaxy Luna. It comes with some great features like a 5" screen and 16 GB memory that make it very similar to the Samsung Galaxy Sky, but at a slightly lower price. We will share the full list of features and specs for the Samsung Galaxy Luna Pro, followed by our review and comparison to the Galaxy Sky and other similar devices. Tracfone is continuing to add new smartphones to their lineup with the Samsung Galaxy Luna Pro one of several recently released. You can keep up with what's new on our Latest Tracfone Smartphones List. Remember, though, that many of the newer phones from Tracfone will not include triple minutes, which is a recent change Tracfone has made. We discuss more about this in our post, Tracfone Changes to Triple Minutes for Life. Let's start with the Galaxy Luna Pro's quick pro's and con's. While the Galaxy Luna Pro does come with 16 GB Memory, which is typically the minimum acceptable amount, it doesn't come with Triple Minutes which may be disappointing to some users. But, for those who already purchase the smartphone only cards anyway, the lake of triple minutes doesn't really make a difference. For many, the smartphone only cards are a better deal. Size: 5.55" x 2.76" x 0.34"
Samsung Electronics is a multinational company based in Korea and the second largest information technology company behind Apple. They are the largest manufacturer of mobile phones, with the Galaxy line being their most popular. The Samsung Galaxy Luna Pro is designed as a budget friendly device but it still has the specs to keep up with moderate smartphone users who want to run a variety of apps and maybe some games. Let's look at the details about this phone to learn more. Featuring a 5" TFT screen with HD resolution and gorilla glass protection, the screen is bright and quite good for this phone. Its not up to the level of a flagship phone like the Samsung Galaxy S8, but this device is also much less expensive. The bezel on the sides is actually very small, and overall the phone has the look of a more expensive phone. The biggest change going from the original Luna to the Luna Pro is the step up from 8 to 16 GB memory. Although 16 GB memory is still not a lot of space, it leaves enough room for storing your favorite apps, photos and some videos. The Android OS takes up about 7 GB, leaving around 9 GB free. Remember that the storage on the Galaxy Luna Pro can be expanded using a Micro SD Card (up to 256 GB). The Galaxy Luna Pro also has 1.5 GB RAM and a 1.4 Ghz processor (Qualcomm Snapdragon 425) that results in good performance and multitasking. Overall the performance on the Luna Pro is very good for a phone at this price. It has enough storage and power to keep up with surfing the web, using various apps and most games. While the rear camera is just 5 MP which seems a little limited, it is actually very capable and can shoot HD video at 60 fps and has autofocus, flash and more. The front facing camera is 2 MP and works well for video calls and selfies. A 2600 mAh battery comes with the Luna Pro that gives about 26 hrs talk time, and 20 days on standby. We're very impressed by this, and while average uses will probably get slightly less battery life, the Android 6.0 operating system does a great job at reducing battery drain. Tracfone has released several phones with Android 7.0, but the Galaxy Luna Pro only comes with Android 6.0.1 Marshmallow. It is still a relatively recent OS, but remember that you won't be able to get any updates. With Android you have access to over 1 Million apps on Google Play and many are free. Many of the newer phones Tracfone is releasing, including the Galaxy Luna Pro, do not come with Triple Minutes for Life, a feature they used to include with all smartphones. This only affects users who typically buy regular airtime cards such as the 60, 120, 200 and 450 minute cards. For those who already buy the Smartphone Only cards, there is no difference. 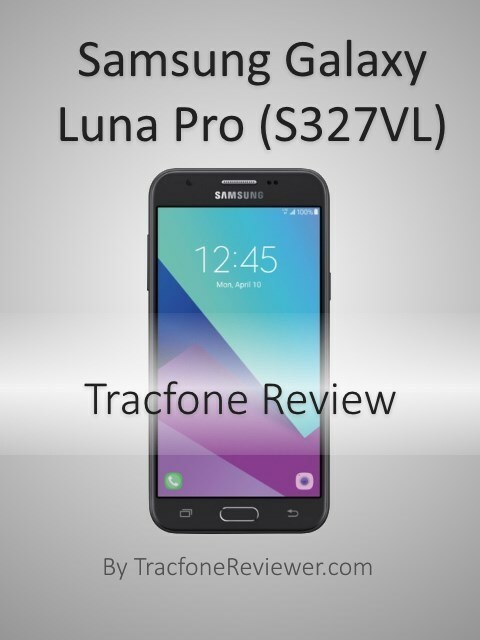 The Samsung Galaxy Luna Pro (S327VL) is a nice upgrade in many ways over Galaxy Luna and many of Tracfone's other older smartphones. It offers very adequate performance, storage, camera and battery life at a great value. Currently on sale from QVC with 1500 minutes for $99! We've also found it available from BestBuy, but for $99 for just the phone. The Galaxy Luna Pro is very similar to the slightly older Galaxy Sky. They both have 5" touchscreens, Android 6.0, 16 GB Memory and 1.5 GB RAM. They differ in the processor, with the Luna Pro featuring a newer, slightly more powerful quad core processor. The Galaxy Luna Pro is actually available for a little less than the Galaxy Sky, and would be our pick between the two. Compared to the Galaxy Luna, the Luna Pro is an upgrade in most ways. The only downside would be that the Luna Pro does not include triple minutes. We also recently reviewed the ZTE ZFIVE, which has a 5" screen, Android 6.0 and Triple Minutes. However, it only has 1 GB RAM and 8 GB Memory. Compared to the ZFIVE, the Luna Pro is a better choice for those who will need the extra internal memory and performance. That concludes our review of the Samsung Galaxy Luna Pro. You can learn more about this phone by checking out the online tutorial. Leave a comment below with any thoughts or questions. Visit us on Facebook where we share the latest news and posts, and have a growing community of helpful users. Check out our latest Tracfone Deals and Discounts list! 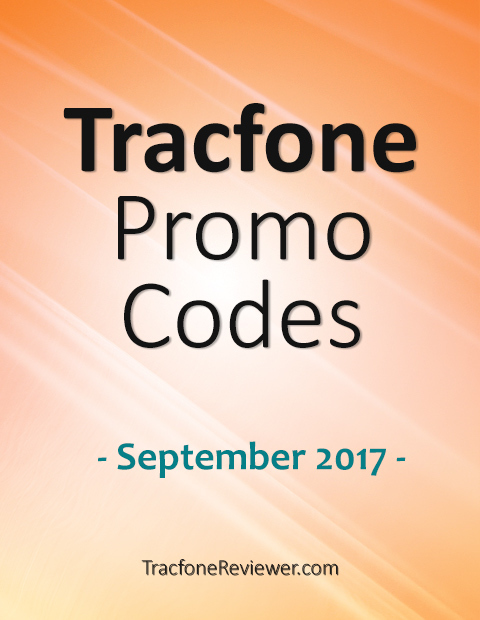 Summer is fading, school is starting, but we have new Tracfone Promo Codes to bring to you! Each month Tracfone releases new promotional codes to use with their prepaid airtime cards for extra minutes for free. These codes can be used when adding an airtime card. We work hard to collect and test the latest codes to share them here with our readers. We also have a more expansive list of codes on our main Tracfone promo codes page. 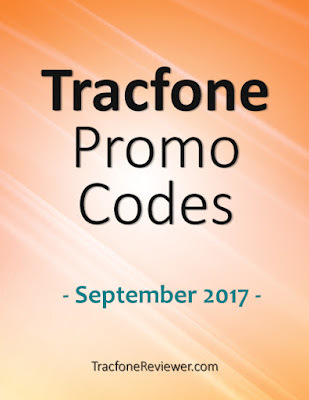 Most promo codes from Tracfone are for use with regular airtime cards, but Tracfone has also released some codes for smartphone only cards. If you don't know all the differences between these cards, or simply want to learn which one is the best deal, visit our Tracfone Airtime Comparison. And if you're considering a new phone, be sure to stop by our Cell Phone Reviews page which has all our latest reviews of Tracfone devices. Now let's look at the new codes for September. Some codes may only be used once, others can be used multiple times. Those are the latest codes, collected and shared here for our readers. We hope they work for you! To see even more options, visit our full Tracfone Promo Code page. Follow us on Facebook where we post news, reviews and more. Plus we have a growing community of users who can help answer questions or provide advice. Also take a look at our 10 Tips for Improving your Cell Signal if you have ever found yourself with a low signal. Thanks for visiting! Leave a comment below with any thoughts or questions!